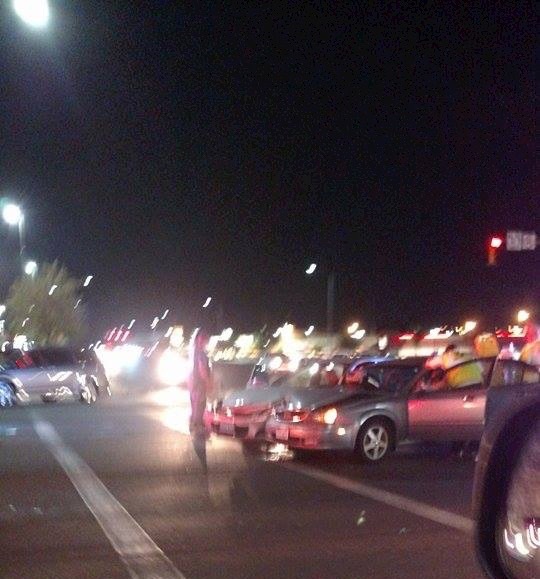 WASHINGTON CITY — A pair of accidents Friday evening almost 5 hours apart had the same cause and effect, damaging five cars and slowing traffic through a Washington intersection that has become known for being accident-prone. The first accident happened about 4:45 p.m. Friday, Washington City Police Public Information Officer Ed Kantor said. A blue Kia sedan southbound on Green Springs Drive failed to stop at a red light at Telegraph Street and collided with a westbound tan Buick. The impact pushed the Buick into a third car, a black Ford SUV also westbound on Telegraph. “They kind of all ended up in a pile in the middle of the intersection,” Kantor said. The driver of the Ford SUV was transported to Dixie Regional Medical Center in St. George for evaluation due to the air bag deploying. 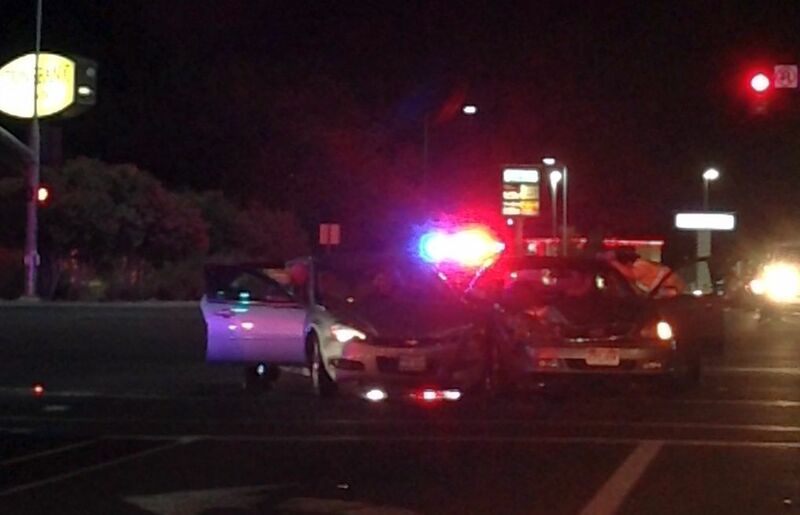 The driver of the Kia sedan was cited for failure to obey a traffic signal. 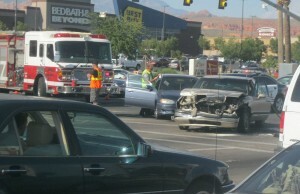 All drivers and passengers were wearing their seat belts. Traffic was impacted for about 45 minutes. Almost five hours later, at about 9:30 p.m., a second accident occurred at the same intersection. “Almost a carbon copy, minus one car,” Kantor said, relating the second accident to the first. A blue Chevy was southbound on Green Springs when it ran the red light at Telegraph. 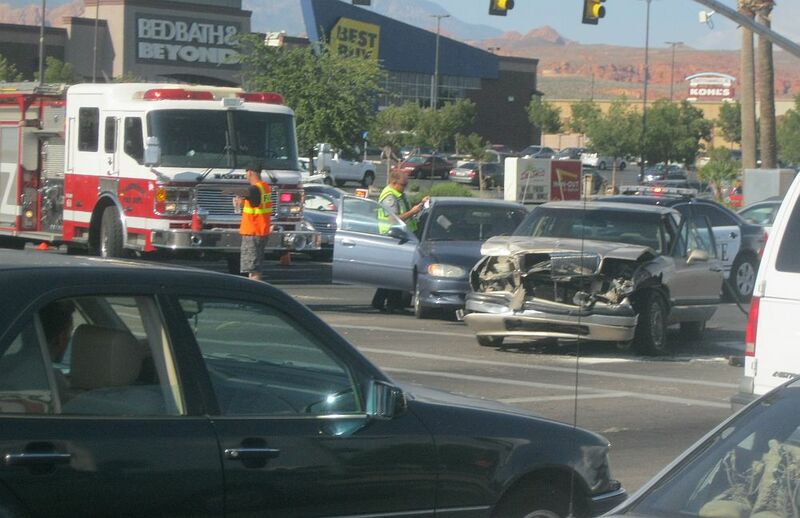 A westbound sedan collided with the Chevy and both vehicles ended up in the middle of the intersection, tying up traffic for about a half-hour. The driver of the blue Chevy was also transported to the hospital because his air bag went off. All occupants were wearing seat belts. Investigation is continuing in this accident. I should buy a wrecker and make a small fortune. These morons around here cant accomplish the simplest of task ,like driving..
As a rule, a crash prone intersection is a result of poor traffic engineering. BUT, that doesn’t apply when you factor in the lousy drivers indiginous to St G.
It’s just a very busy intersection, nothing more. What would you do to engineer that intersection better? As I’ve said before, folks who complain about St George drivers in particular don’t get around much. Poor engineering indeed, coupled with poor signal placement, protected/permissive signal system, amateurish road markings and lack of enforcement. Since moving here 8 years ago, I have never witnessed so many “Right of Way” and “Red Light Violations’ in my entire life. Let’s face it folks, they’re not even close. Take all that, factor in the “Blue Hairs” that can barely see over their steering wheels, and you have a recipe for disaster. The I-15/Green Springs is completely FUBAR for 1500 yards in all directions. This of course this can be attributed to a lack of planning by city officials who appear to have never seen or heard of an Environmental Impact Report. Why else would you cram so many businesses and restaurants at one intersection with limited egress to parking lots, and then go ahead and approve approximately 300 new residential dwellings at the top of Green Springs which will only add insult to injury. Yes, poor engineering, and planning. That’s what makes Green Springs/Telegraph the debacle that it is for us all. The wait at that light is so long, so many drivers race thru on the yellow instead of waiting another round. 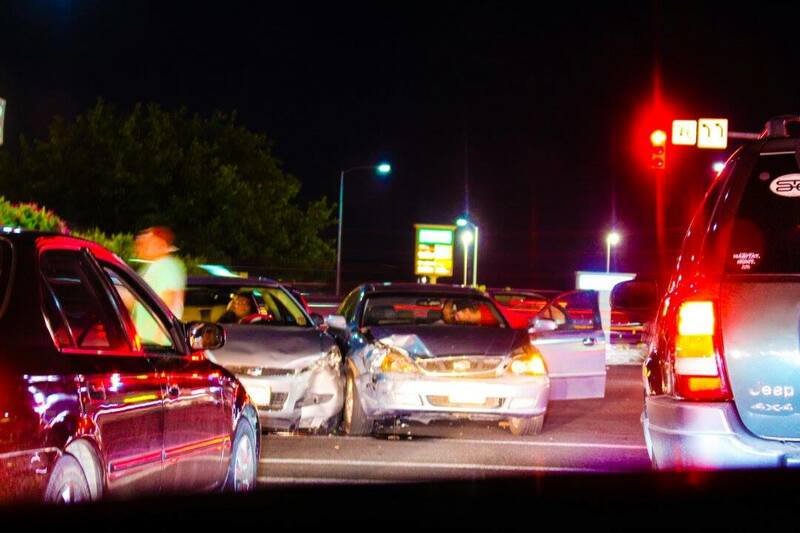 The inevitable results is many crashes, and many citations for running a red light. Now you have a wrecked car, fines to pay, bad points on your licence, higher insurance premiums, and a possible lawsuit against you. And your not going to get to where you were in such a rush to get to anytime soon. Was it really worth it to try and beat that light?